Posts having to do with Arcade Machines and Pinball Machines! 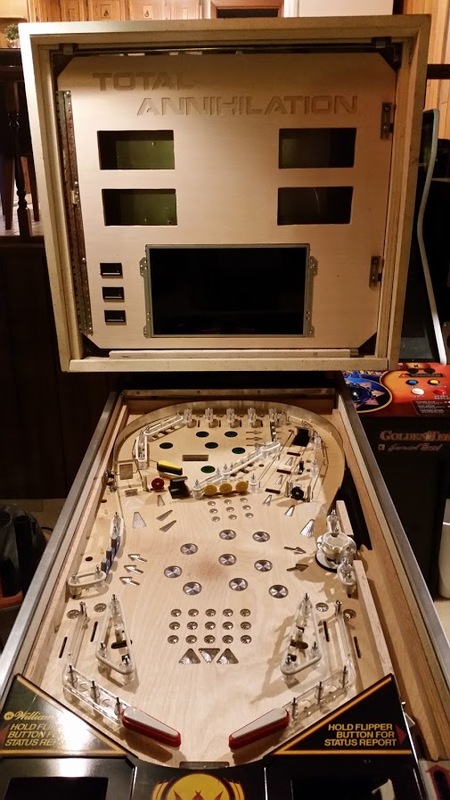 Total Nuclear Annihilation Pinball Update #15 – Dead Flip Livestream! 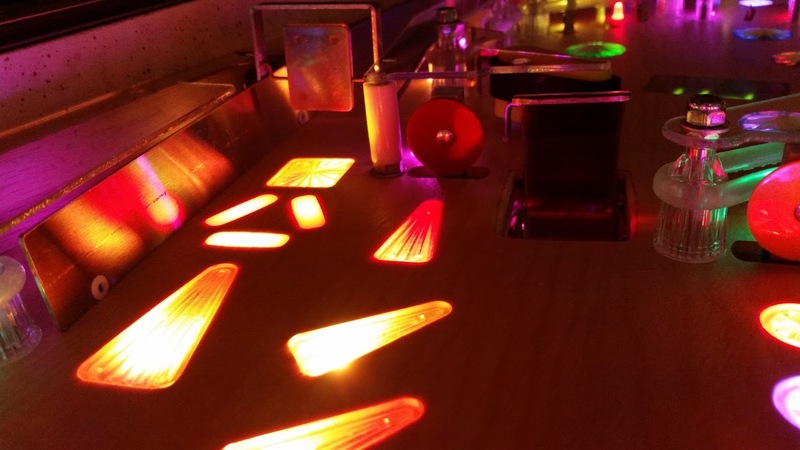 Posted in: Arcade Posts, Events, Total Nuclear Annihilation. Hey Everyone! In case you missed it, the Dead Flip crew stopped out to the Sleepy Nut Tavern on Friday 3/3/17 and played the crap out of Total Nuclear Annihilation. Below is Part 1 and 2 of that night. Enjoy! 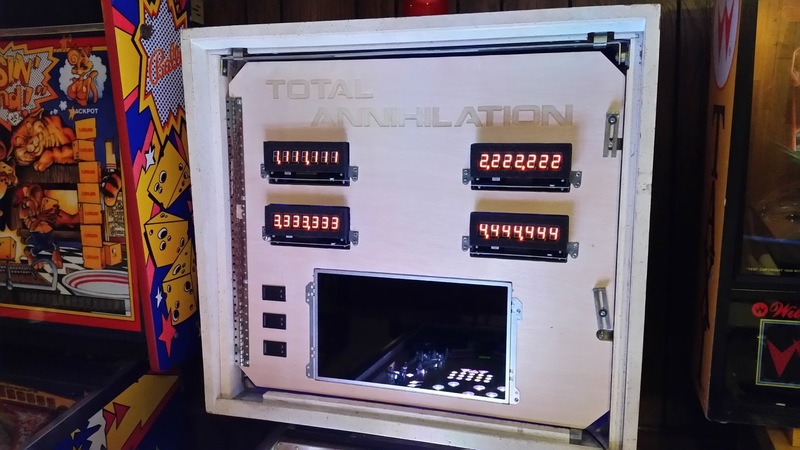 Total Nuclear Annihilation Pinball Update #14 – First Gameplay Video! OK, enough of my blabbering on, here is the link to the video. Enjoy! 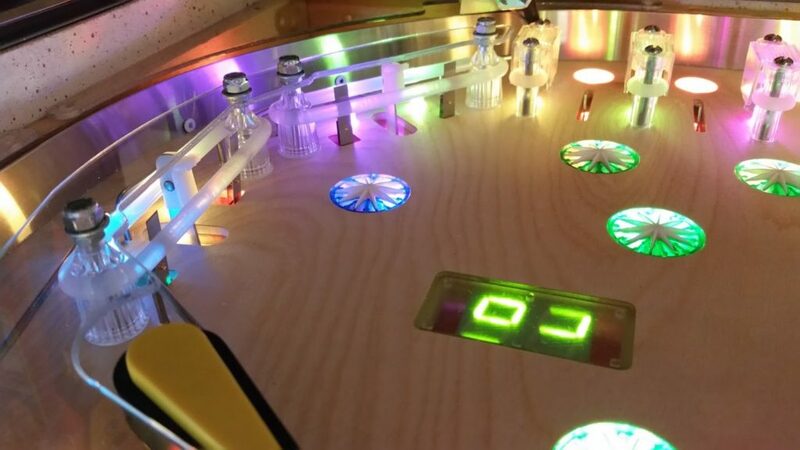 Just wanted to let you know that Total Nuclear Annihilation will be set up Friday night, through the rest of the weekend, at the Multimorphic booth at Pinball Expo in Chicago! Please come by, play the game, and chat. I will periodically have the game opened up for people to view the inner workings. Remember, if you are caught wearing a Total Nuclear Annihilation shirt, you get a free high five. See you guys there!!! Total Nuclear Annihilation Shirts – Thank You! 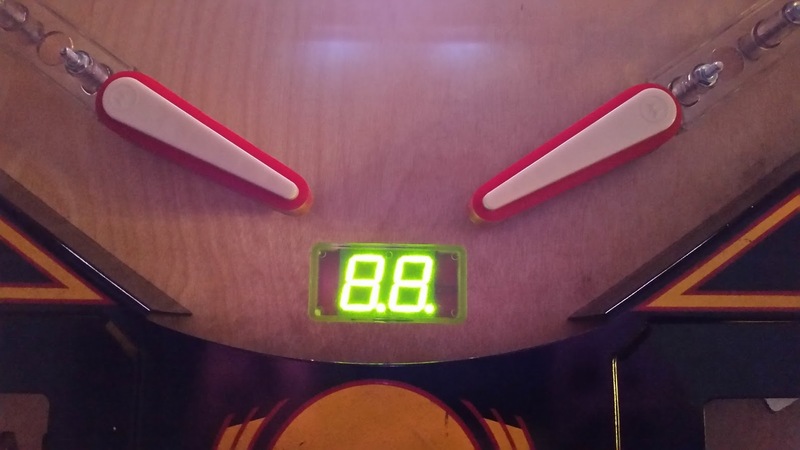 Posted in: Arcade Posts, News, Total Nuclear Annihilation. Thank you everyone that ordered a Total Nuclear Annihilation shirt. I really appreciate it. I have ended the campaign and we were able to raise $41.39 for the American Cancer Society. I know it may not seem like much, but every little bit helps. You should be receiving an email notification with your tracking info from Teespring in it shortly. 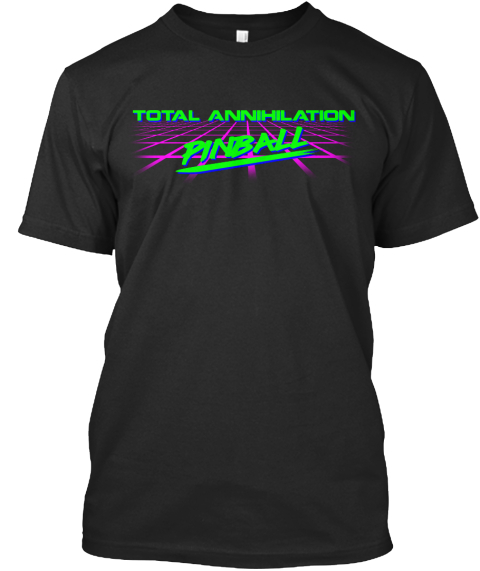 Remember, you will get some sweet high fives if you wear your Total Nuclear Annihilation Shirt to Expo! See you there! 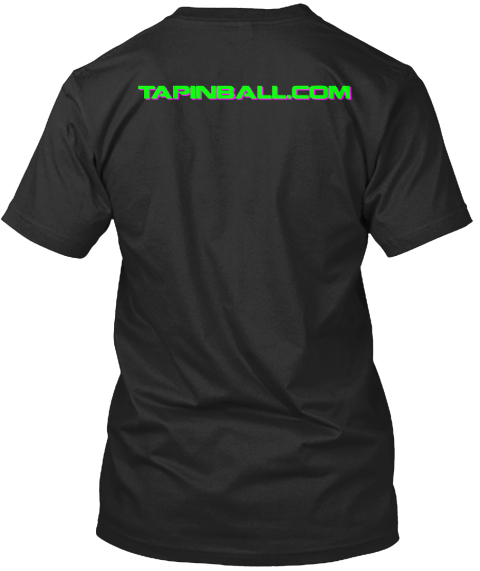 Total Nuclear Annihilation Pinball Update #12 – Total Annihilation Shirts! Hope to see you guys/gals at Expo! I know it has been a while since my last update. 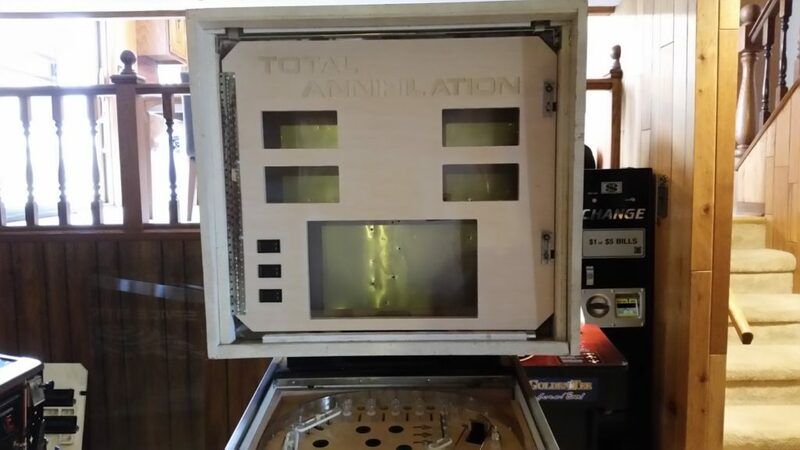 I have been working very hard on the machine getting it ready for public viewing at Expo 2016 in October. I have done a bunch of stuff to the game, but unfortunately, I am not going to show it here. You are just going to have to come out to Expo and see it for yourself. I promise I will get a bunch of pictures during Expo for those of you that cannot make it. I have also been working on the story for the game, so here is a little introduction. The year is 1988. You will be traveling from this time into the distant future to stop a civilization from discovering reverse time travel. This civilization is pretty advanced, but their weak point is that they run nuclear power as their main source to the power grid. You will need to activate and destroy all 9 main reactors that they have on the island. Unfortunately, you will not be able to return. 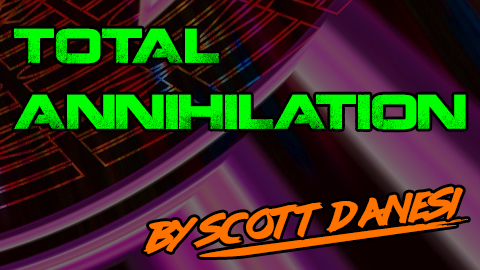 Total Nuclear Annihilation will have art, music and sound effects with a 1980’s vibe. The color scheme is Neon Green, Neon Pink, and Orange. Below is a glimpse at a few of the attract mode screens. These may change in the future, who knows… Looking forward to seeing you guys and gals at Expo! Enjoy! Just wanted to post a quick update. When I was describing my sound system tuning process to a friend, it occurred to me that this could be a pretty cool little update. I am going to keep it semi-simple as this can be a wormhole of confusing information. So here is what is going on. Whenever you have a very powerful sound system that you hobbled together yourself, it is pretty risky to just tune your subwoofers by ear, especially if the output of your amp is close to the RMS rating of your subwoofers. 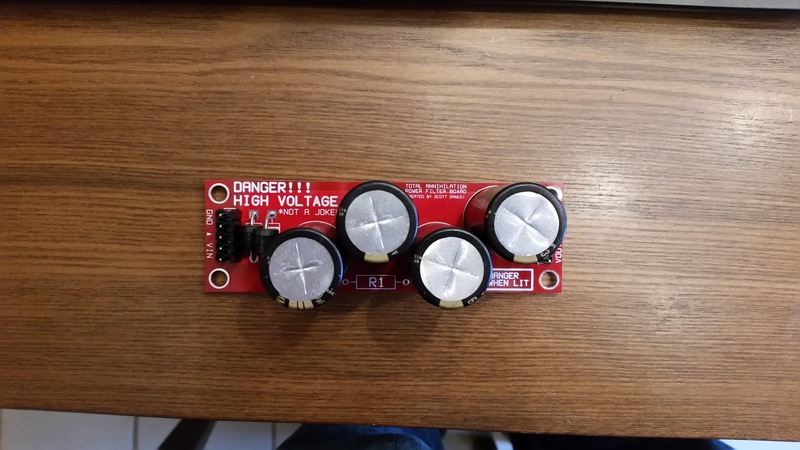 You can easily blow up a speaker by sending clipped output signal to them from the amp. What is a clipped signal? What does it look like? For this conversation, we are going to pretend that our sound is a perfect sine wave. The image below shows our perfect sine wave on the left. On the right side, you can see that the sine wave is now flattened at the top and bottom. This is called clipping. Clipping happens when an audio signal is pushed louder than the amp can handle, so some of the data is cut off from the signal itself. Now, back to my machine… What I need to do is make sure that none of the audio signals are clipping on my machine, but still drive the amp and subwoofer as hard as possible. So here are the high level steps that I took to verify that everything was ok. 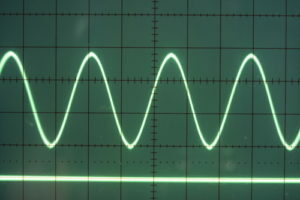 I then disconnected the audio cable from the computer to the subwoofer amp and hooked up my oscilloscope to the output signal from the computer. This allowed me to physically view the sound wave on my screen, you know, with my eyes. This is called checking the pre-amp signal (in case you wanted to know). I then started a game and took a look at the 50hz sound wave that was now playing. You can see from the image below that the signal is nice and smooth (no clipping). Yay! Next I plugged the computer audio cable back into the subwoofer amp and disconnected the subwoofer. The next thing I did was turn down the amp gain all the way to 0% (this is important). The oscilloscope was then hooked up to the high level output of the subwoofer amplifier, just like how the speaker is hooked up. I started another game to get the 50hz signal playing. Then I turned the gain amp up slowly until I could start seeing the sine wave. I kept going until I saw a bit of clipping in the signal and then backed it down slightly under that limit. This is simply called the amplifier signal (post amplified signal). OK, OK, so there are a TON of technical details and nuances that I purposely left out of this post as it would have made it not fun to read. Well, that is about it. You now know how to properly check your audio amps for clipping. All you need is some time and an oscilloscope. 🙂 Also, the sound system has never sounded so good in Total Annihilation. See you guys/gals at Expo 2016! I know it has been a while since my last update, but I have made some MASSIVE progress over the past month. I currently have the game completely wired up and SkeletonGame running! Yes, my game flips and plays multiplayer games. It also keeps track of some basic scoring! 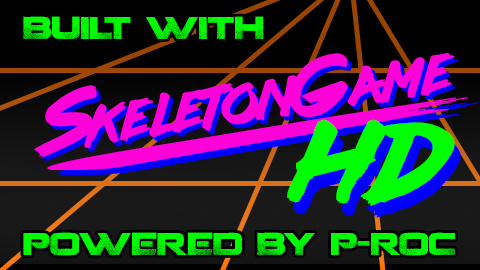 So you are probably asking what the hell is SkeletonGame. It is a framework for P-ROC written by a good friend Michael Ocean. It is used as a starting point for people wanting to build a custom or re-themed game using PyProcGameHD. I will be using SkeletonGame for my base game and helping the team improve the framework as I go. Well, so let’s check out some chronological photos!! 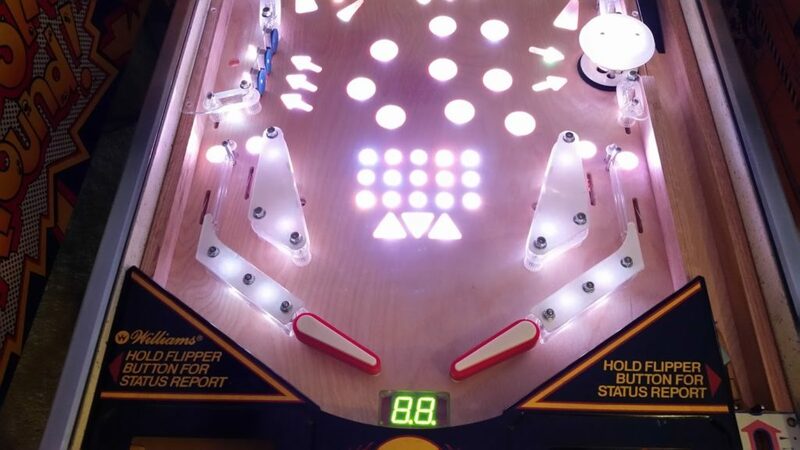 Here is a shot of some LED color testing I was doing on the playfield. Just making sure all the wiring was OK! Below is a quick shot of the coil test service menu in this early version of SkeletonGame. This version will be upgraded to a better version soon when Josh Kugler merges his version with SkeletonGame. 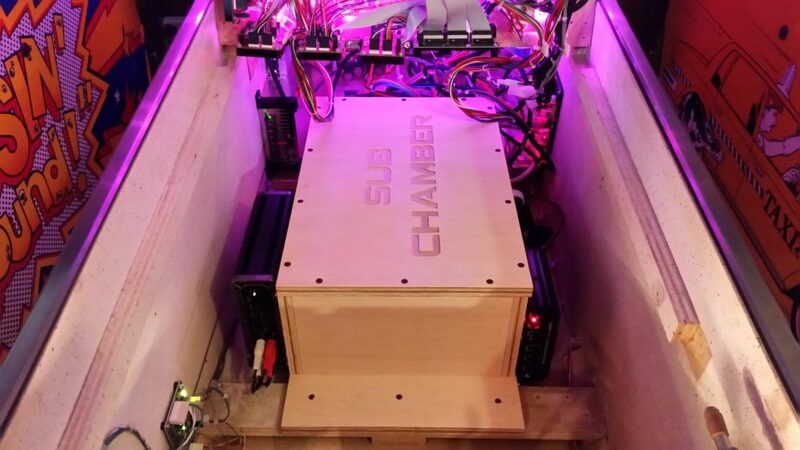 Here is the beginning photos of the Sub Chamber that will be on the inside of the cabinet in Total Annihilation. 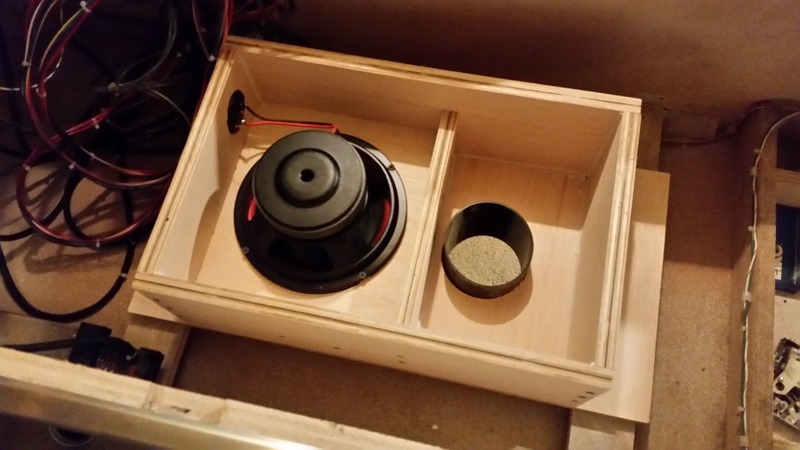 This is basically a small bandpass box that houses an 8″ subwoofer that fires into a sealed chamber. 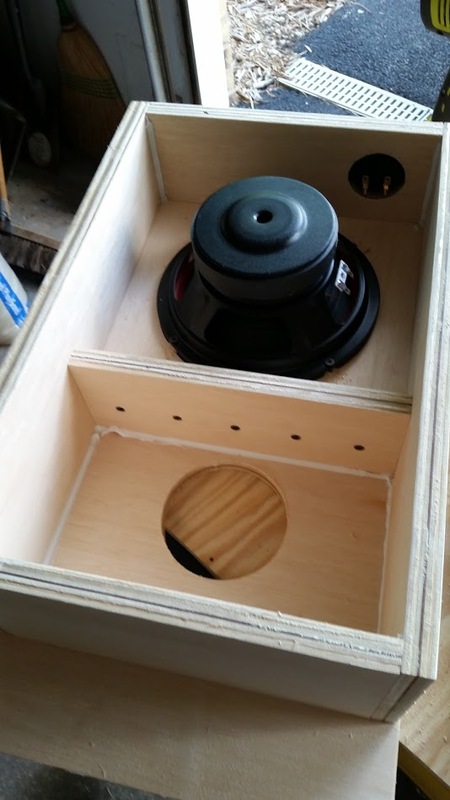 The majority of the subwoofer sound will exit the bottom of the cabinet through a 4 inch port hole on the open side of the chamber. I have already done a bunch of testing with this and 2 blown subwoofers later and a new Kicker car amplifer, I decided to stick with pure mobile audio components. I am using a Kicker brand subwoofer and amp for this setup. 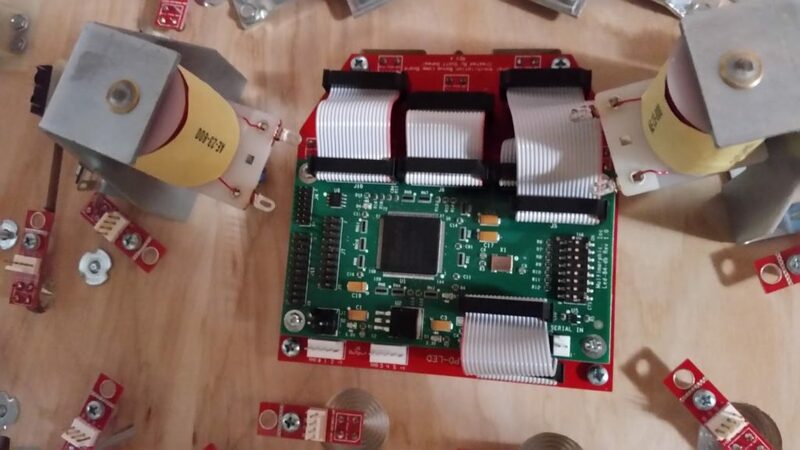 Oh, and another 12v supply that can provide up to 55 amps of current. 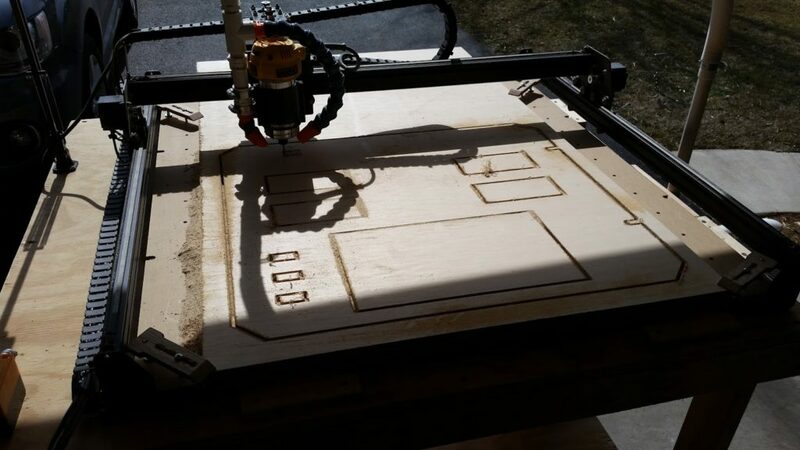 This is a screenshot of one of the CNC CAM setups I programmed for the Sub Chamber. I will be using the Dutch Pinball suite to build some of my lampshows for this project. 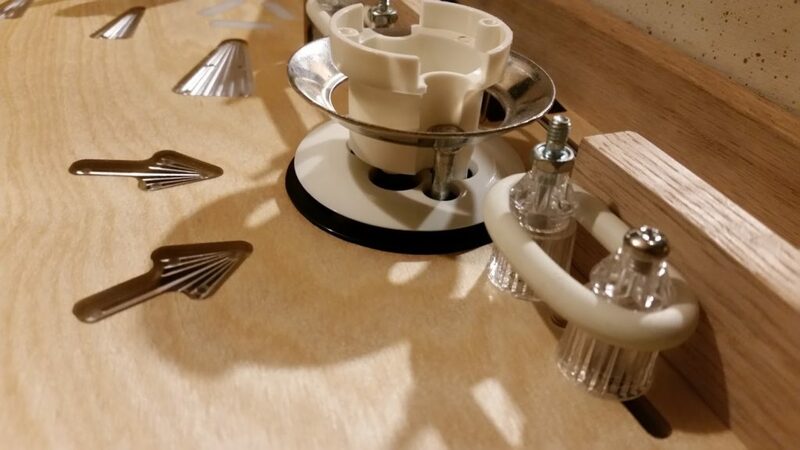 Below is the base image that I use for that process to map the insert and GI lamps. Below is a quick video of my test attract mode. It is basically cycling the colors and putting random colors to each lamp. Kind cool eh? 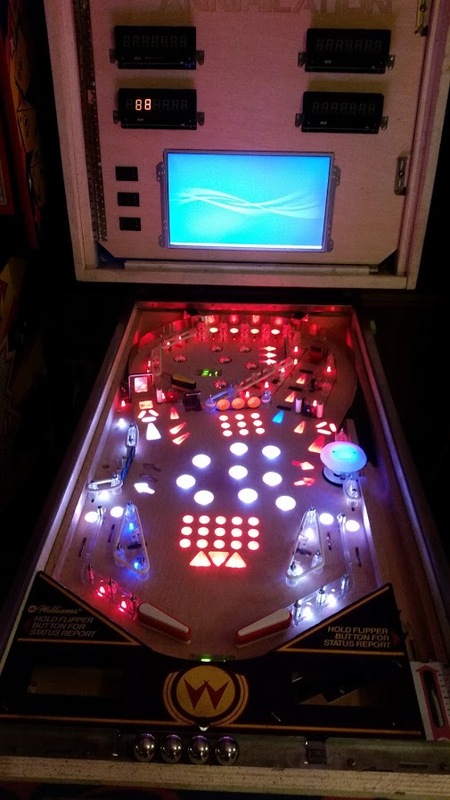 Now to finish this off, here are a bunch of cool glamour shots of my playfield lit up in attract mode! Hope you enjoyed the update! It’s been a while, but I promise you a great update. 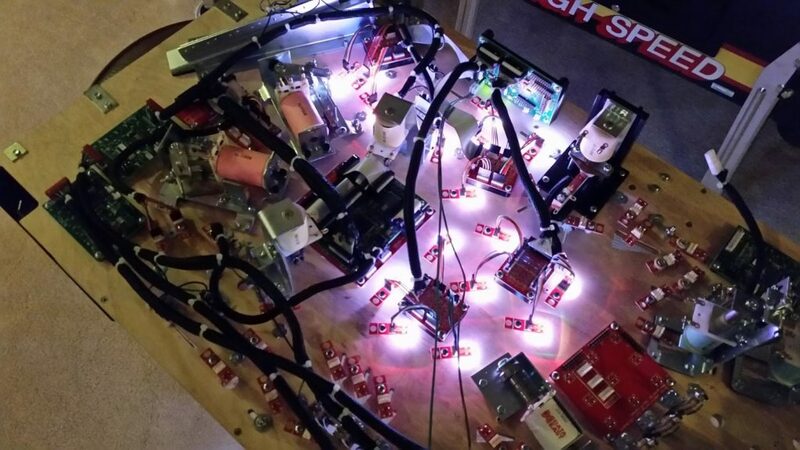 I have been making a large amount of progress on the playfield wiring and other various items on the checklists. Check out the progress below! I finally got both of my controlled gates built and installed! 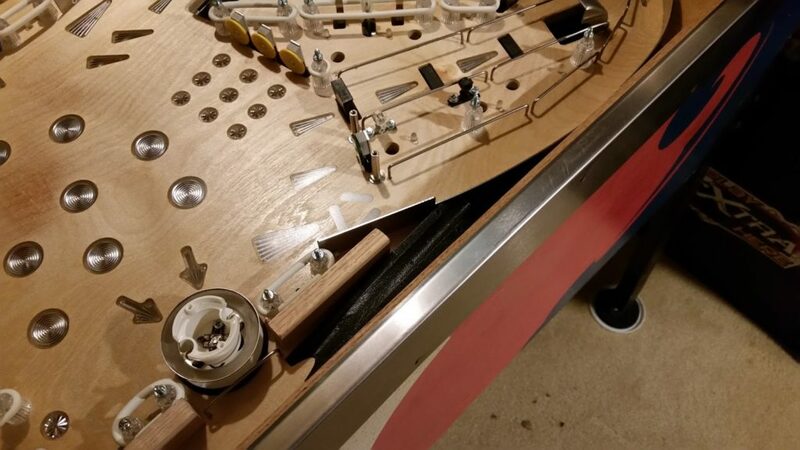 These are using coils under the playfield to pull them up as needed. This will be a very cool feature of the game which will allow me to open the orbits on the fly. 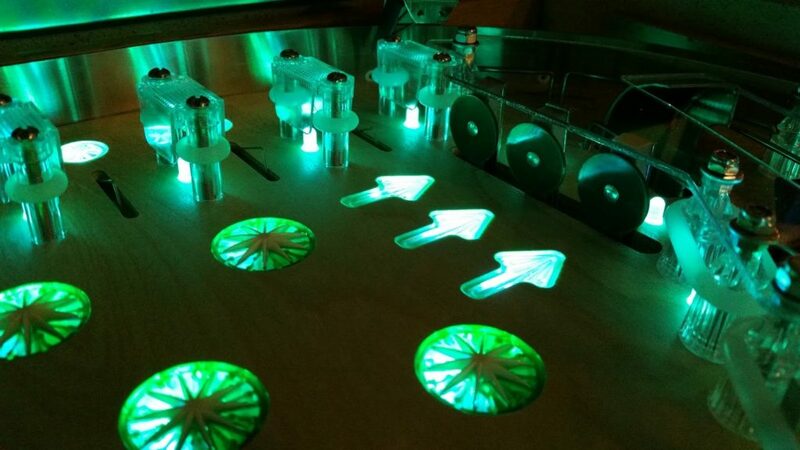 My LED segments are alive! These are really cool looking in person. I will be able to display ball save countdown seconds along with linking them to my lamp shows to do some really cool stuff. 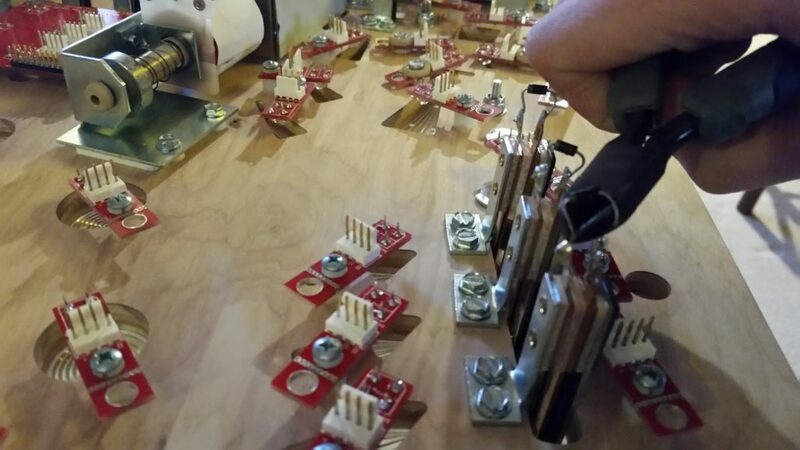 Making progress on the wiring of the breakout boards and the RGB LED boards. 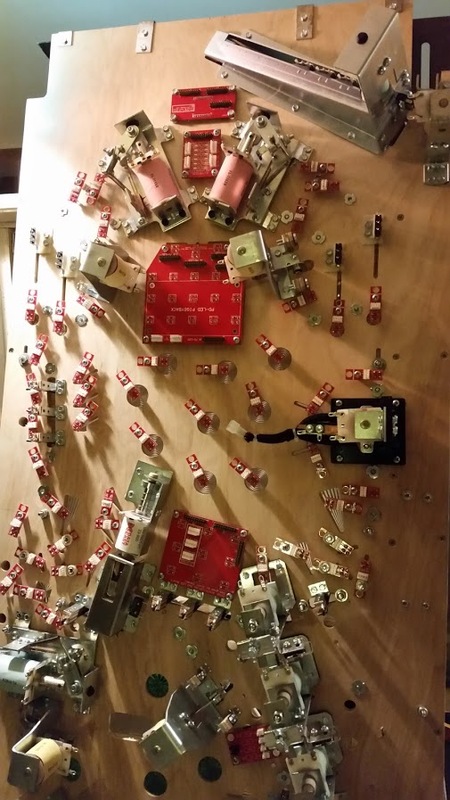 Here is a closeup of one of my RGB breakout boards. 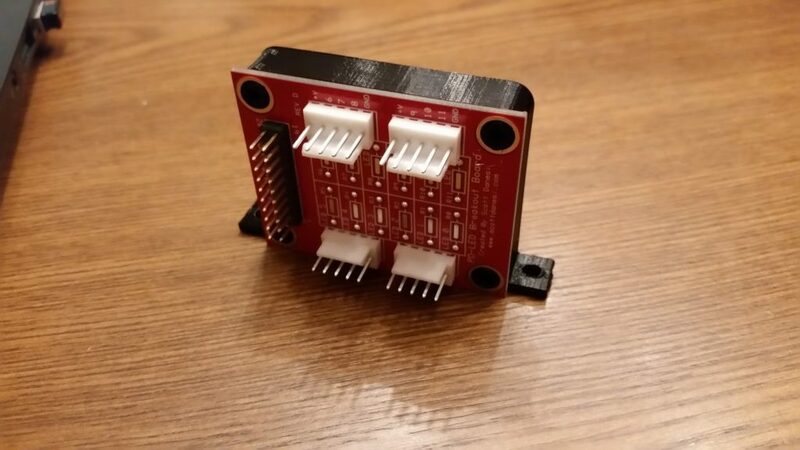 This connects directly to the PD-LED and then has headers to connect to the RGB LED boards. 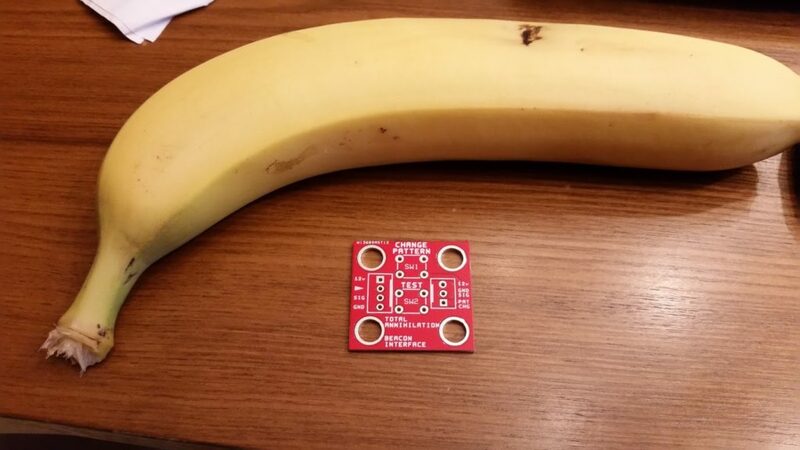 Pretty handy little PCB. More progress on the wiring. You can see I am starting to run the switch harnesses from the switches to the SW16 boards just off the left side of the image. OK, it is starting to get really crazy here. 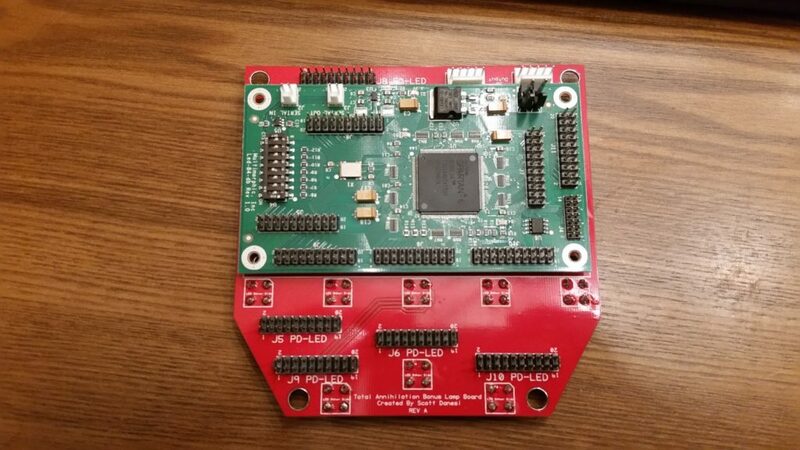 This PCB is a custom shield that houses an Arduino Nano that will control my 4 numeric Bally displays. Ok, here is where it starts getting pretty cool in the display department… These displays in the picture are being controlled by the Arduino Nano using some code written by Mr. Jim Askey of MyPinballs.com. These are now ready to go! Of course, I could not leave the code as it was. 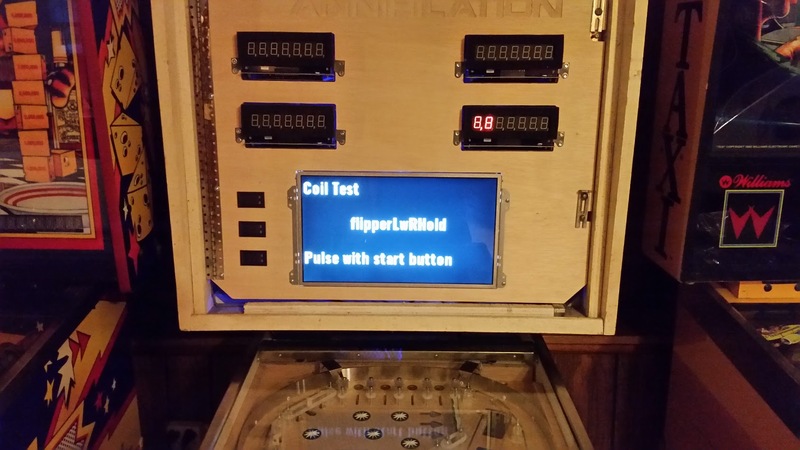 I created a very cool little startup test sequence that will show up upon initial boot. Video below. I have been covering most of my wires with black wire wrap to keep it clean, but these are just too good looking to cover up. 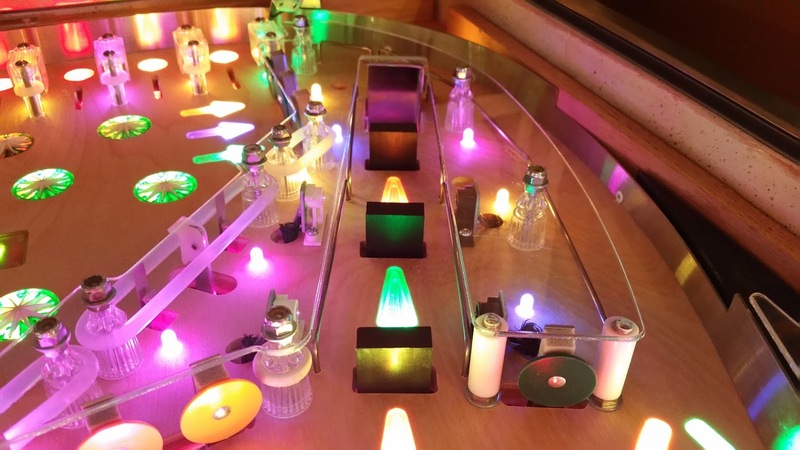 These are the plugs that lead to one of the banks of coils on my playfield. 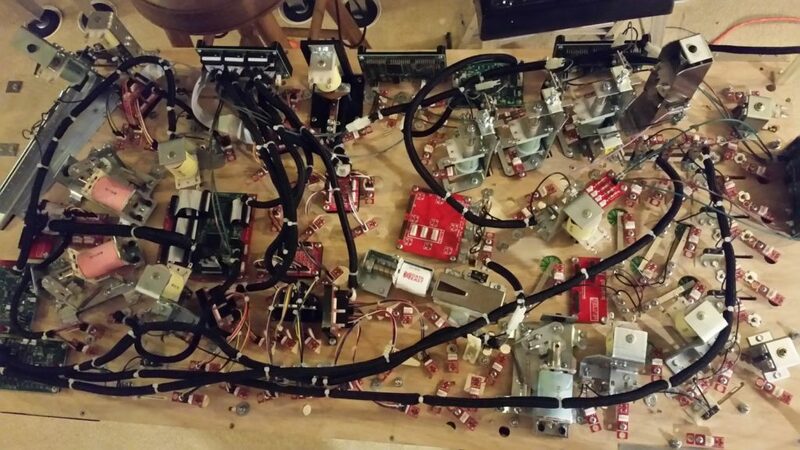 And for the final pictures of the update… You guys aren’t going to believe this, but I successfully completed all the under playfield wiring. 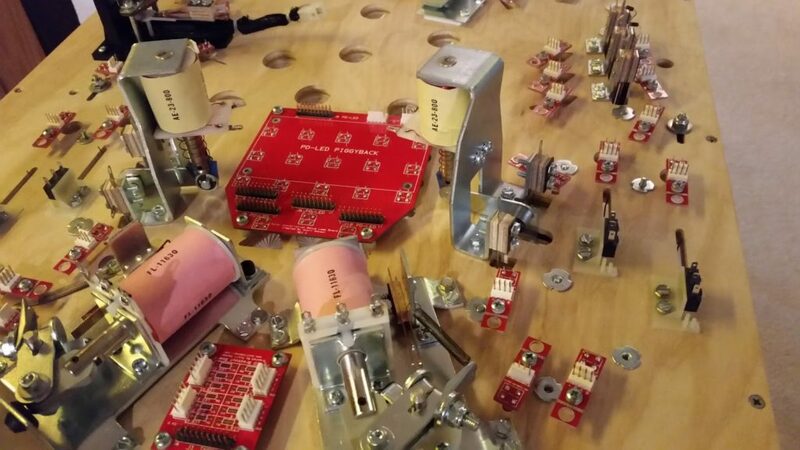 This includes all serial connections, power connections, switches, coils, and lamps. I am pretty much done under there. Now onto the cabinet! 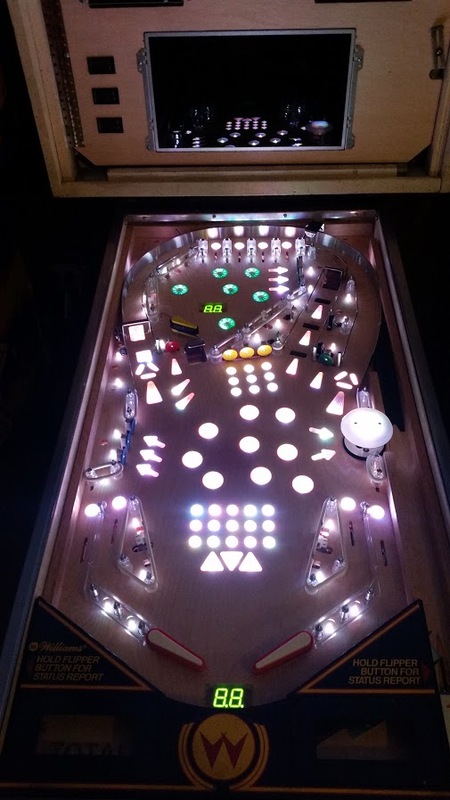 Here is a picture of the playfield with all the inserts lit up at full power! Hope you enjoyed the update, until next time! 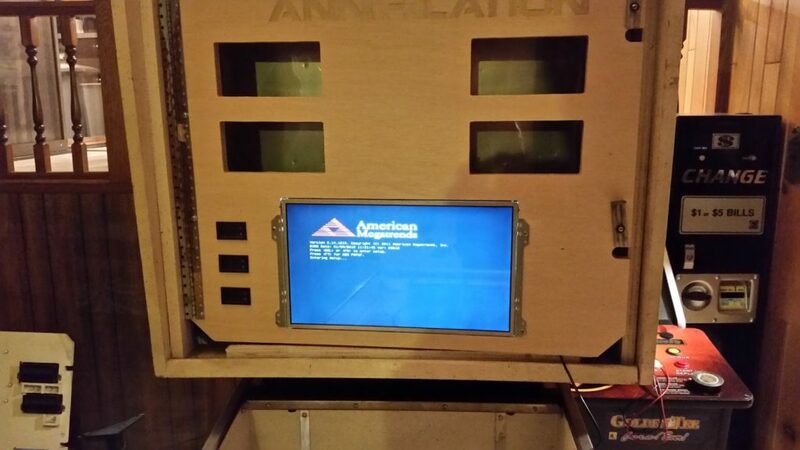 I know it has been a while since the last update, but I am making awesome progress on the machine. Not too much to talk about, but I have a bunch of pictures to show all the progress. Check it out! 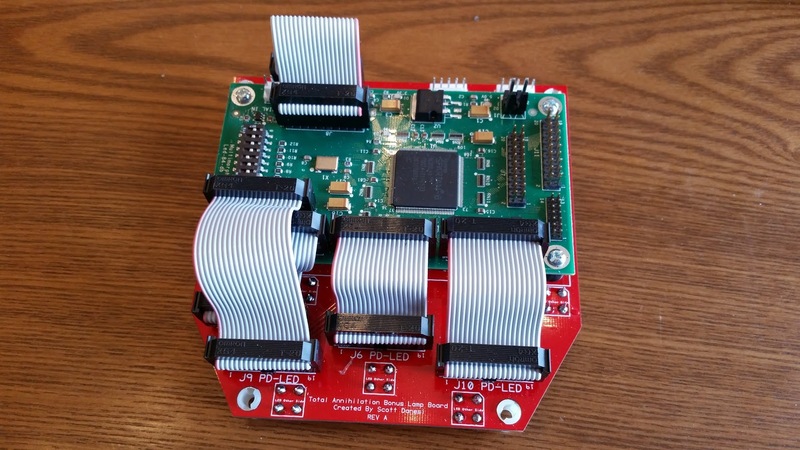 This is the 3×3 matrix PCB with direct PD-LED input headers. Less wires = good. 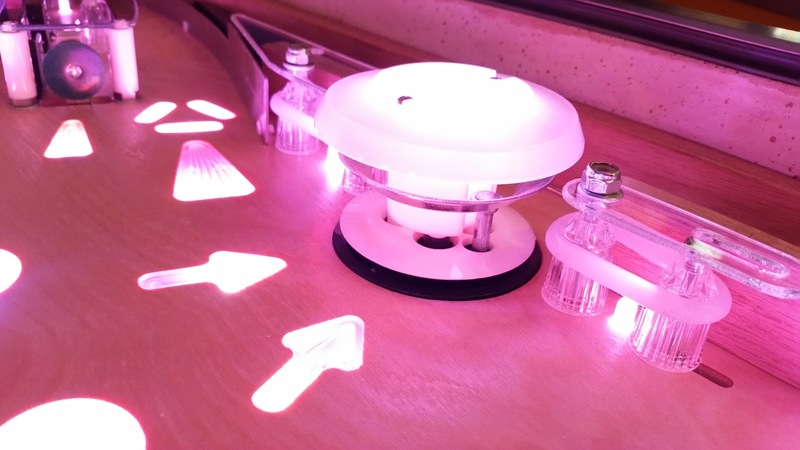 Here is the Bonus LED PCB with the PD-LED piggyback. I was just test fitting in this picture. 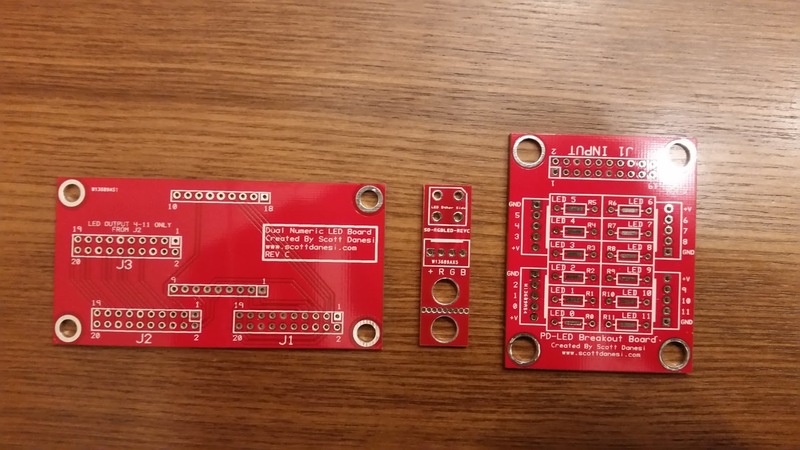 The other boards turned out great! 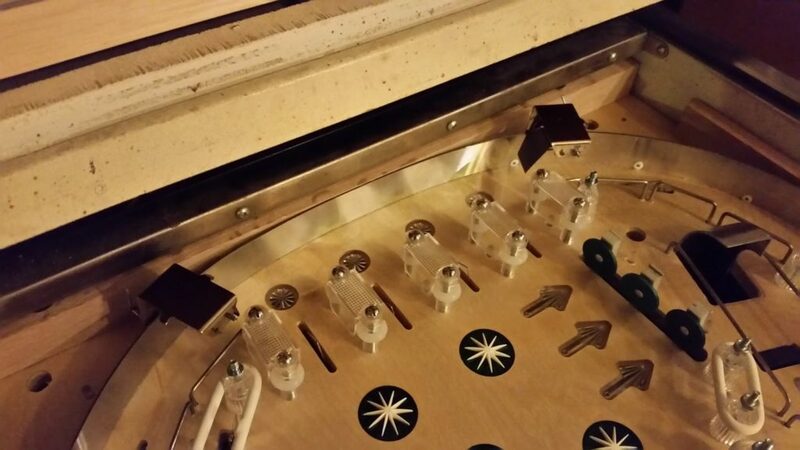 Starting to mount the custom PCBs to the bottom of the playfield. Deciding on the exact spinner placement. This position won. 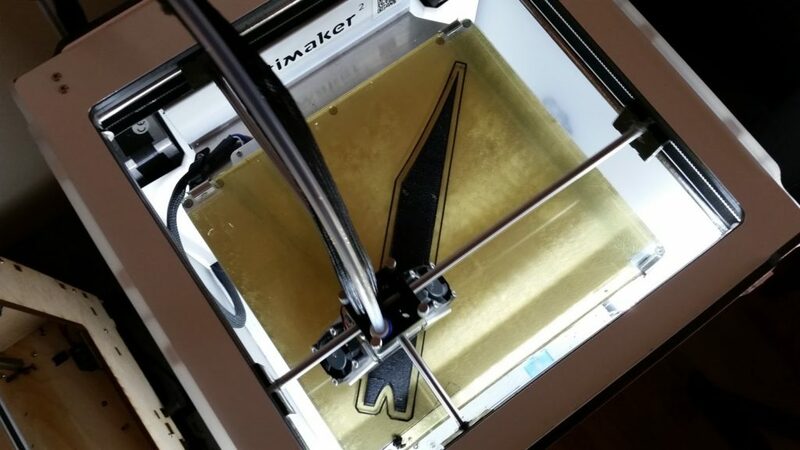 3D Printing the shooter lane skip ramp that allows the ball to enter the orbit on the right side. Hard to see, but the skip ramp is mounted and works great. 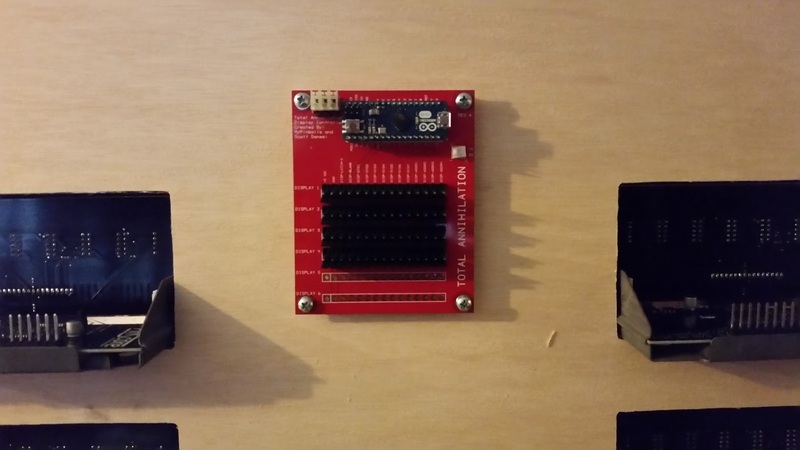 More progress on populating and mounting some of the custom PCBs. 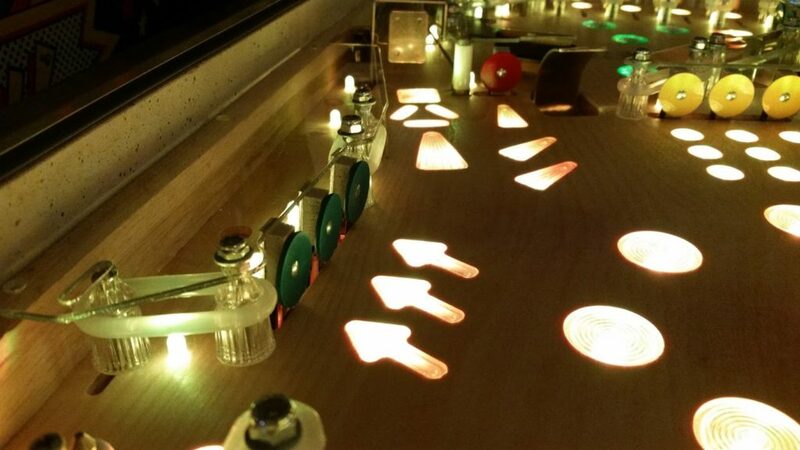 Assembled bonus LED PCB with PD-LED piggyback. Very cool looking. 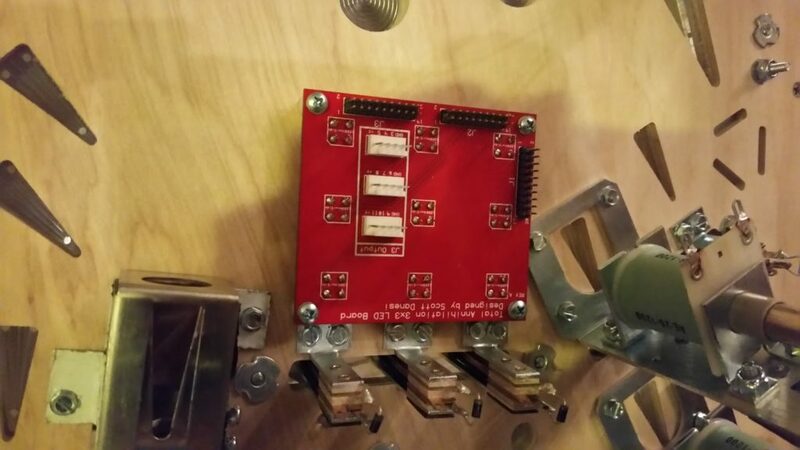 Here is that same board mounted between the slingshots. 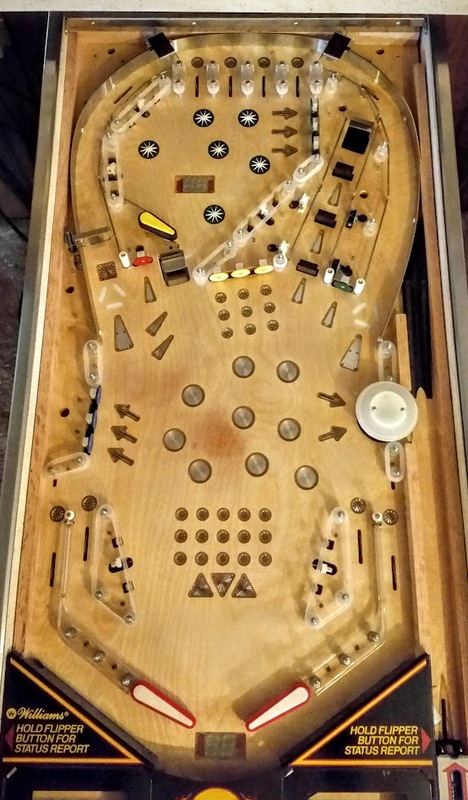 Every pinball machine from the 80’s needs a backglass insert panel. I drew this one up to hold 4 LED numeric displays and my LCD. Here is a photo of the insert panel mounted in the backbox. Just a close-up of my single pop bumper. This is a DE style pop bumper with a black base. Computer has been mounted and powered up… Only problem is the computer that I was planning on using would not POST. The motherboard ended up being toast, so I “recycled” it and used a Zotac C Series. 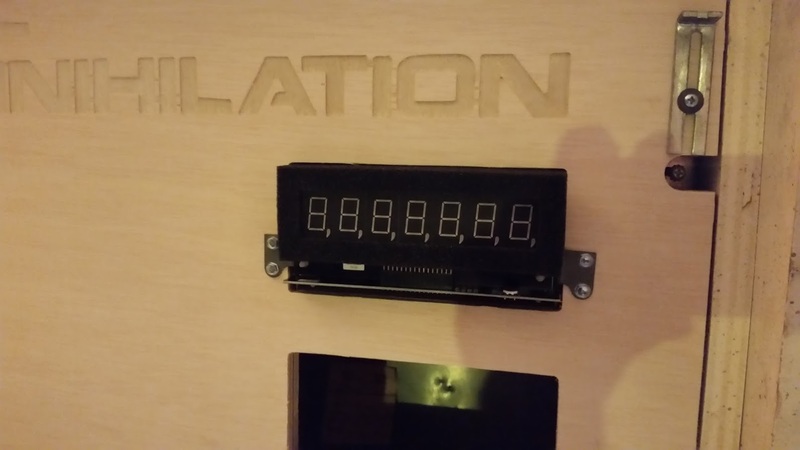 Test fitting the Bally LED displays. They fit and look great! Diodes? I have no need for you! First boot of the PD-LED and the bonus LED assembly. I also wired in 2 GI lights to the left just to try them out. They ended up not being as bright as anticipated, but I compensated for that by putting them EVERYWHERE. 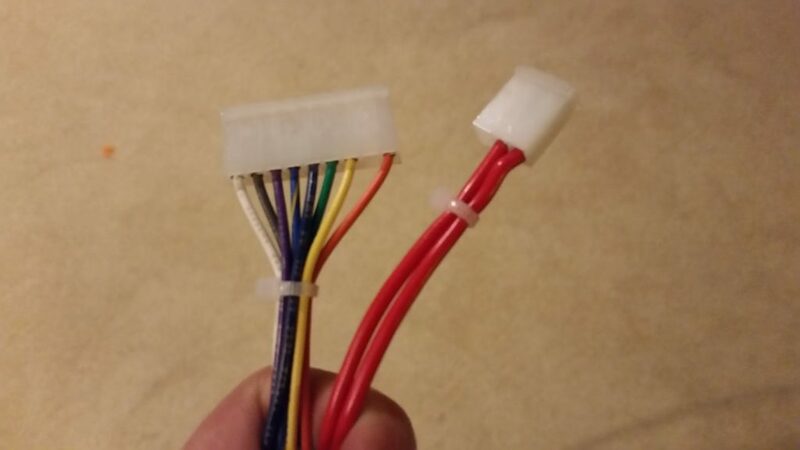 There is always going to be issues when using bulk electronics. 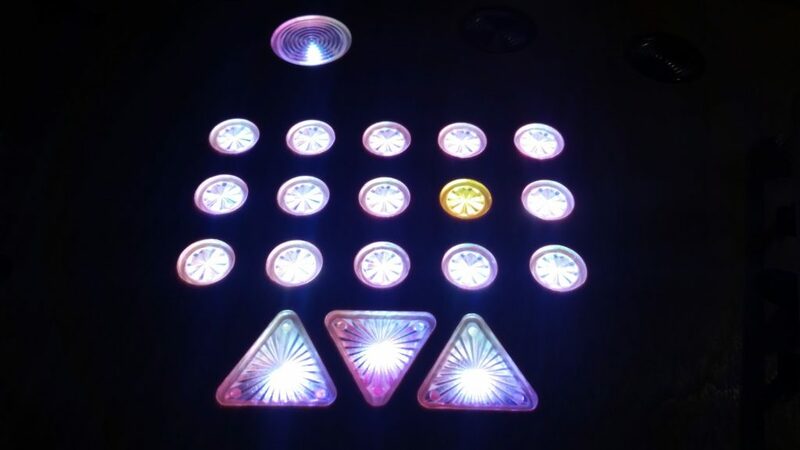 In this case, I had the blue channel burn out on one of the Piranha LEDs. All good though, they are cheap and I will be able to repair it easily. Now for the finale. 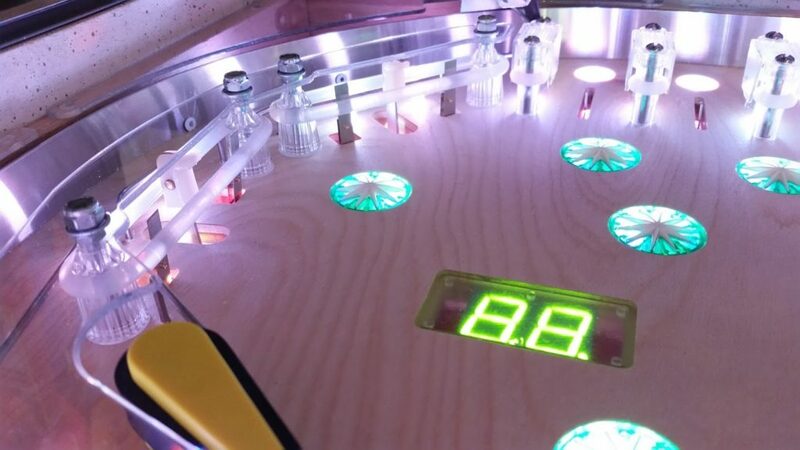 This is the latest picture of the bottom side of my playfield in full resolution. I have successfully wired up 32 of my switches. I have a bunch more, but will hammer through that pretty quickly. 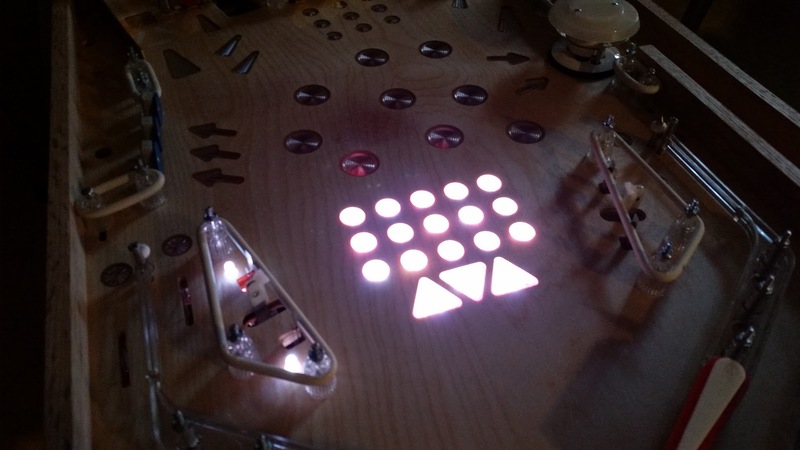 I can then focus on getting all the LEDs wired up and do a full LED test. Hope you enjoyed the update. Stay tuned for more.